The direct bus service through the Hong Kong – Shenzhen Western Corridor seems to be the most convenient and popular way to travel between Hong Kong and Shenzhen Airport. Please see my previous posts here and here. The route is from Kowloon Station to Shenzhen Airport, and vice versa. 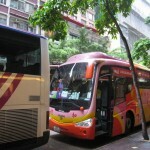 The service has gained such popularity that the bus company ChinaLink has started to run a new route, this time from Wanchai on the Hong Kong island to Shenzhen Airport, with effect from 21 April 2009. The service point in Wanchai is located at The Wharney GuangDong Hotel (No. 57-73, Lockhart Road). Take MTR and get off at Wanchai MTR Station, and take exit C. You will be at the Lockhard Road. Turn left and go straight. After the first junction (between Lockhart Road and Luard Road), the hotel is at the right hand side. The bus company has a reception inside the hotel lobby. One-way price from Shenzhen Airport to Wanchai is RMB100, and two-way price is RMB180. Please note that the earliest bus departing from Kowloon Station is 06:15. So if you want to take a very early bus, you should use the Kowloon Station bus service. Also, at Wanchai service point, you can not check in for flights from Shenzhen Airport. Only at the Kowloon Station, you can do so. The total bus journey time between Wanchai and Shenzhen Airport is about 80 minutes, excluding the immigration time, which is about 15 minutes. As said in my prevous posts about the direct bus service between Kowloon Station and Shenzhen Airport, the advantage of using this bus service is that it uses Hong Kong-Shenzhen Western Corridor, which is open to vehicles only, so it is fast, and the Chinese and Hong Kong customs at the border crossing (called Shenzhen Bay Port ) are located under one roof, so it is convenient. But note that the last two buses from Shenzhen Airport (23:00, 23:30) use Huanggang border crossing, which may lead to longer travel time. Matt’s comment is correct and extremely useful! There have been some changes. We traveled on 2/18/2012 from Wan Chai. First the place to buy tickets is between the hotel mentioned above and the Pacific Coffee just a little further down. It amounts to a lady sitting in a folding chair with a clipboard. A little shady, but we went with it and made it. She said you need 3 plus hours, it only took about 2 or so for us on a Saturday afternoon. The schedule started at 7:15 then 7:45 after that every once an hour at 8:45, 9:45 and so on until 7:45 PM. The cost has gone up to 130 HKD one way and 210 round trip. I didn’t get the schedule, but we arrived at Kowloon on the hour and left right away so I assume it leaves on the hour from Kowloon. going to hk is no problem. but re-entering shenzhen may be a problem if you only have a one-entry China visa, unless you get a shenzhen visa at lowu, but that will allow you in the Shenzhen area only. Hi, We have booked to go to Shenzhen then onto Hong Kong for 3 day’s. Then back to Shenzhen and mainland China. Our Chinese Visa has only one entry on it. Does that matter for Hong Kong? Or will we be ok to re-enter at Shenzhen? Where can I get the ticket? Thank you! I’m arriving in Shenzhen this weekend, would like to try the bus service by Chinalink from SZ airport to Wanchai. Where do I find the service counter at the airport? My parents are arriving in Shenzhen tomorrow, where in the airport is this chinalinks buses ? Thanks for publishing this. I asked for a map when I left Shenzhen, and they just said, “Get back on at the place where you get off.” Naturally, as soon as I got of the bus, I just started walking without paying attention to bearings or landmarks and now I’m scrambling to find the same bus when I leave. Well good tip, I will try SHZ Airport tio Wanchai in Oct., however besides gut discription of HK departure location, what I miss is an info where in the SHZ airport is the bus company counter located. 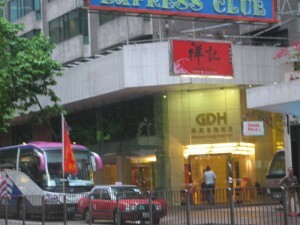 Hi, I came across your blog while google’ing for the direcrt bus from Wan Chai to Shenzhen. Is it true that we can check-in and get our boarding pass at this service point? And if so, do you know how long in advance are we required to go there to check in? Thanks in advance for your reply. HI, I will visit Hong Kong from June and then travel from Tsim Tsa Tsui to Shenzhen. I will stay in the Luo Lu area of Shenzhen and would like to know if there is a direct train or bus, from Shenzhen to the Hong Kong International airport. Where can I get the cost as well as the dates and time the bus or train (most convenient) from Shenzhen to Hong Kong Int airport.